Court time rates are $18 + tax per hour. Call for lesson pricing. Do you want to learn tennis or just get back into the game? Contact Oliver or Jason to find out about beginner lessons, private lessons, and leagues. We have something to fit your schedule and tennis needs. Please scroll down to see all our available programming. Email one of our pros for more info regarding private lessons. Random court time may be reserved by Courts Plus members as much as 7 days in advance. Summer court time for members will be half price! Memorial Day thru Labor Day. Call to reserve a court or login to your account to book courts from the comfort of your house or office. Permanent court time rates are discounted to $16 + tax per hour. Permanent court time may be reserved with our Director of Tennis, Oliver Summers. Court fees are paid for the entire session at the start of play. Contact the front desk for more information or to reserve a court. It is our policy you may not solicit or conduct on the premises any personal training or tennis lessons with or without compensation. You cannot hire a coach to teach at our facility unless that coach is an employee of Courts Plus Community Fitness who has been hired to personal train or teach private lessons specifically. Oliver moved to the states from London, England after completeing his studies at the University of Portsmouth. There he played no. 1 for their University team. Oliver has been teaching tennis at Courts Plus for the last 18 years and has coached many state champions and college bound tennis players. In 2012 Summers was named Head Coach for the Minnesota State University Moorhead women’s tennis team, an NCAA Division II program. Jason played Collegiate tennis for the University of Minnesota Morris and has spent the last 20 years as a school teacher and Tennis coach. Jason has been Head Coach for the Fargo South Girls and Assistant Coach for the Boy’s Team for the last 20 years successfully coaching multiple State Champions. At the end of year rankings Jason was ranked no. 1 in the Northern Section in the Men’s 35’s. Jason is an excellent instructor and his extensive knowledge and skill make him an excellent choice for the beginner and advanced player alike. Jerry is originally from Fargo and has been a professional with us for many years. He is well known and respected in the local tennis community. Jerry was awarded the USPTA Northwest Division Coach of the Year for 2003. Jerry has the ability and experience to teach the novice player as well as the national ranked player. Zach Zitur has many years of playing and teaching experience. He played for Concordia College Moorhead and is currently the Head coach there. He has been teaching here at Courts Plus on a regular basis and is also now our resident Pickleball Pro and can help you reach the next level! Julia Geske was a 2 time state qualifier in Minnesota AA and is currently the top ranked player on the MSUM Dragons tennis team. Last year she was all conference in singles. She spent last summer as a camper at the Gustavus tennis in life camp and is certified with the Profesional Tennis Registry (PTR). Julia is enthusiastic and knowledgeable and can help you reach the next level. 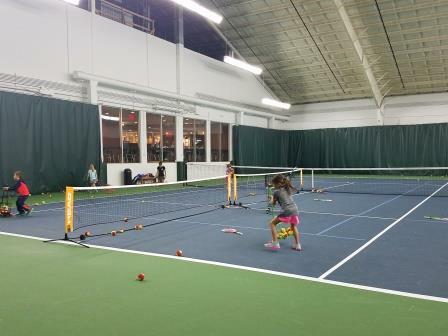 Our Star Junior Tennis program uses a progressive court system that uses 36’, 60’ and 78’ (regular size) tennis court. Coupled with ensuring the proper racquet length and using different types of tennis balls based on age and ability, our goal is to get your child playing tennis as soon as possible. This system gives your child a visible progression to maximize their improvement. For children ages 4-5. The goal is to expose children to the FUN of tennis through movement while using Red transition balls, which was developed to give kids more success. For children in grades K – 2. The goal is to continue to have FUN and to develop ball judgment skills, improve motor skills and to learn the early stroke mechanics of a forehand, backhand, volley and serve. For children grades 3 –5 or appropriate skill level. The goal is to continue to have FUN while focusing on the stroke mechanics of the forehand, backhand, volleys and the serve through instruction, drills and fun games. For juniors grades 6 –8 and grades 9 – 12. The goal is to have FUN while focusing on the stroke mechanics of the forehand, backhand, volleys and the serve through instruction, drills and fun games. The ultimate goal is to prepare students for the MXP program. These lessons are held in the Summer at Elephant Park, Discovery School and Fargo South schools. Having trouble with our online registration system, for Adult or Junior programming? MXP is competitive training for the serious junior tennis player. Stroke production, singles and doubles strategy, footwork and mental toughness will be stressed. For players grades 5 and up or the proper skill level. Focus on stroke development as it pertains to point play. Lessons include two one-hour practices and one match per week. Ratio 6:1. This level is for USTA Tournament players These players are EXPECTED to play in ALL local USTA Tournaments. Please discuss possible exceptions with Jason or Oliver. Focus on competitive play strategies, footwork, and mental toughness. Two practices and one match per week will be offered. Please choose two days of Monday-Thursday that work for you. Players will be divided by ability on those days. This is our exciting, fun program designed to keep you playing in your off season and get you ready for the next season. This program is intended for varsity level High School players. On the back you will find an entry form and each team will use one form per team and the team’s registration fee has to be submitted at the same time. Each team must designate a responsible adult/adults as their coach who will decide the line-up and sign off on the roster each week. Each team must consist of at least 3 boys and 3 girls from the same high school who are 7th grade and above. Matches will take place on Friday’s from 6 – 8pm and will be a JTT format, a set of boy’s singles, a set of girl’s singles, boy’s doubles, girl’s doubles and a mixed. A maximum of 4 boys and 4 girls will play each week. Girls can play in a boy’s slot if the team is short of players. Our league supervisor will be there each week to help you follow the rules. We encourage you to register more than just the minimum of 3 girls and 3 boys because there will almost always be someone gone each week. Courts Plus Community Fitness offers a number of different adult leagues and lessons, please view all our programs below. Match times: 6-730pm, 730 – 9pm, Monday nights. Member fee: $144($9 per time) other wise it’s $12 per time. Tennis Express, learn how to play tennis in 6 weeks! Match times: 730 – 9pm, Tuesday nights. The Courts Plus Pro Shop is determined to offer you the best selection of string, grips, racquet advice and other accessories in addition to our knowledgeable and courteous staff. If you are looking for a particular item we currently do not have it in stock, please contact us and we can get any item from Head, Prince, Wilson or Babolat. This includes racquets, string and bags.